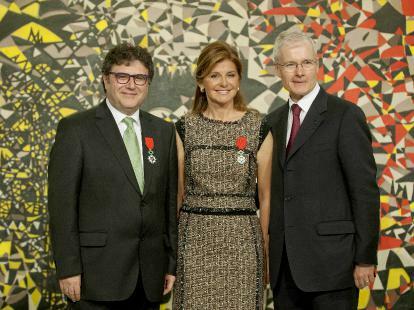 Istanbul Modern Executive Board Chair Oya Eczacıbaşı and the Istanbul Foundation for Culture and Arts, or IKSV, Director Görgün Taner have been deemed “Chevalier dans L'Ordre National de la Legion d'Honneur,” is regarded as the most prestigious award in France. The award was presented Thursday at a ceremony at Istanbul Modern by French Ambassador to Ankara Berbard Emie two days before leaving his duty in Turkey. Emie said Istanbul Modern had become a symbolic place dedicated to contemporary creation and modernism in Turkey, adding that the award was presented to two leading actors in Turkey’s cultural life who had played a great role during the Turkey’s Season in France.